The North American continent is one of the premier wildlife viewing and photography spots in the world. It covers 10 time zones and is home to majestic mountains, stunning glaciers, lush temperate and coastal rain forests and countless miles of beaches, fjords and inlets. In addition to its scenic beauty, there are approximately 1,000 species of mammals and birds each, native to the land. The opportunities for wildlife and landscape photography are so diverse it is impossible to capture everything on a single trip, or even a single life span. For this article, I will limit my discussion to one particular place in North America - the State of Alaska, because one can see all three species of Ursi, namely Black, Grizzly and Polar Bears, majestic Golden and Bald Eagles, plus many different species of birds (including hummingbirds) and exciting whale species, like the Blue, Humpback, Bowhead, Orca, Beluga and many other cetaceans and pinnipeds. I have been photographing wildlife in Alaska for many years now and have encountered many visitors from Australasia and Europe, especially the United Kingdom. My recommendation is to prioritize the species one would like to see before focusing on capturing their images. Black and Grizzly bears can be found from Ketchikan in the south, all the way up to the Brooks Range and other mountains in the southern Arctic region. Some great spots to see and photograph them are in the Tongass National Forest, near towns like Ketchikan, Wrangell, Hoonah and Haines. Kodiak Island and the Katmai National Park are prime locations to see the Kodiak brown bears. Polar bears are usually found near towns like Barrow, Wainwright and Kaktovik, deep in the Arctic Circle. Southeast Alaska is also a great spot for whale watching, especially the waters around Juneau, Seward, Kodiak, the Inside Passage and Icy Straits. Bald and Golden eagles are quite prevalent with the former rather ubiquitous around towns close to the water. 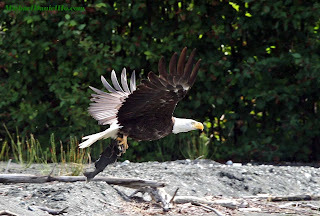 The town of Haines boasts the largest concentration of Bald eagles in the world during the month of November due to the late run of salmon in the Chilkat River. The Alaska Bald Eagle Festival is held every year in town and attracts thousands of photographers from around the world. The Northern part of Alaska, deep inside the Arctic Circle, is a favorite spot for birders and photographers. Although the number of species are not huge, millions of waterfowls and shore birds feed and nest around numerous lakes and puddles across the Arctic tundra. Snowy Owls and Arctic Foxes are often seen hunting on the frozen ground. For those who want to photograph the Aurora Borealis, early to mid Autumn is the best time. Fairbanks is probably the most popular spot for photographers chasing the Aurora but on clear, dark nights, one can see the Aurora from many parts of Northern Alaska. Late Spring to mid Summer, around the whaling season, is a good time to visit Barrow. The Northern most town in the US, named after Sir John Barrow, the second Secretary of the Admiralty. Polar Bears can be seen scavenging the remains of whales in Kaktovik after the butchering process is complete. The Inupiat Eskimos are permitted to hunt a small number of whales every year for subsistence living. The state of Alaska is big - over 663,000 square miles. It is about twice the size of Texas, over three times the size of California and about seven times the size of the United Kingdom. Although Alaska is home to lots of glaciers and snow, the summer months can be pleasantly warm, by Alaskan standards, of course. Protected by the Chugach Mountains and the Alaska Range and warmed by Pacific Ocean currents, Anchorage, the largest city in the state, has a temperate maritime climate. Summer temperatures can reach into the high 70s. Low humidity also contributes to Anchorage's comfortable climate. However, temperatures can vary greatly depending on the region one may visit. Therefore, careful clothing selection is important to anticipate the unexpected. The best advice is to dress in layers, whether one is hiking in the wilderness or just walking around town and always have a waterproof parka available at all times. Getting around Alaska is not easy and can be expensive because there are only a few main road systems and the rest of the state is very pristine and wild. For most people, flying into Seattle or Anchorage would be the start of their Alaskan adventure, if they are visiting the Southeastern or Northern part of the state, respectively. Fortunately, there is the robust Alaska Marine Highway Ferry System to connect most cities and towns. In addition, Alaska Airlines and its subsidiary, Horizon Air, can fly visitors into many big and small towns. Lastly, there is an army of bush pilots and a fleet of small planes and seaplanes ready to take adventurous photographers into almost anywhere not reached by the other modes of transportation. For the first time visitor, I advise sticking to one or two National Parks or towns and try not to overextend oneself. There is never any guarantee in wildlife sightings and photography but if one is willing to do some thorough research before going to Alaska and is prepared to spend at least two weeks, I can assure any traveler and photographer an unforgettable experience in one of the most spectacular scenic and wildlife locations in the world.